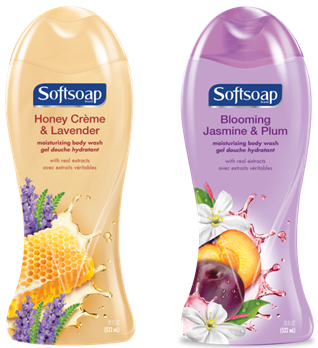 Inspired by today’s trending ingredients, Softsoap Body Wash is excited to launch the latest additions to its fragrance line! With two new fragrances crafted from real extracts of honey, lavender, jasmine and plum, these new scents will turn an ordinary shower into an invigorating sensory experience, all while cleaning and moisturizing your skin. I am a huge fan of Softsoap. It is the best body wash I have ever used. My entire family loves it! I am extremely excited about these two new intoxicating fragrances! I have a weakness for plum fragrance, and so when I tried the Blooming Jasmine and Plum, I was in blissful heaven. It has the perfect balance of floral and sweet plum. It kind of reminds me of a happy time in my childhood when I carried around a plum lip balm that I loved. As for the Honey Crème & Lavender fragrance, I am equally smitten. This fragrance is so uplifting with its delicious-to-my-senses sweetness of honey and comforting lavender. As always, Softsoap has a luxurious, moisture rich formula that I adore. I love to lather up from head-to-toe in my shower, and Softsoap body wash allows me a perfectly close shave of my legs. I look forward to my nightly showers when I am in possession of my Softsoap body wash! Me + Softsoap Body Wash= Happy Me. You can purchase SoftSoap Body Wash at your local drug and grocery stores. I look for moisturizing in a body wash. My favorite brand of body wash is Olay. I'm like Olay and Dove body washes because they don't dry my skin like some others. I don't have any one brand I always use. I am currently using Dove Deep Moisture Body Wash. I look for something that hydrates my skin and has a nice scent. When looking for a body wash I base it on scent and price. My favorite body wash is Dove. I look for a body wash that smells amazing and feels great on the skin during and after use. I've been using Bath & Body Works for a long time because of the scents. I look for a good scent and products with natural ingredients. I prefer Dove body wash. I love a great scent! I look for a nice lather and clean scent in body wash. My favorite body wash is Caress. I love the Dove scents for my face, thank you so much! I always look for moisturizing agents in my body wash like aloe or Cocoa butter. I love Softsoap but don't have any particular loyalty to one brand. I like Olay body wash. I like moisturizer wash. I look for gentle scents and ingredients for a body wash . . . I like Crabtree & Evelyn body wash products. My favorite is Dove Mens+ Care. I look for scent and price. I don't have a favorite that I usually stick to. I like a product that will moisturise my skin and smells good too! I look for a bodywash that does not dry out my skin and I have been using Dove. I look for a pleasant smell. My favorites are bath and body works. I look for a bodywash that does not dry out my skin and smells great. I don't have a favorite brand. If your mind is fresh so you can have better and refined ideas in your mind to explore the world and the post is an example of freshness for the world because we can learn better in a scented environment than any dump situation. I look for a nice smell. Favorite is a light vanilla. I look for body washes that smell good and have a good lather. I don't have a favorite brand. I like body wash that has a Vanilla or Coconut Scent. I look for a favorite seasonal scent. I look for a refreshing scent. I look for a body was that has natural ingredients and is moisturizing! I don't know what my favorite brand is. I usually look for natural & organic ingredients with nice scents! I look for a good scent. I like Soft Soap. I like something that smells good! I like the brand "Philosophy." I like suave body wash. I like a body wash that has natural ingredients and is good for my sensitive skin. Currently I am using Aveeno, Skin Relief Body Wash. I prefer more natural ingredients. I don't have a favorite. Love a fruity scent!! Using Soft Soap right now! I really like Dove. My body wash has to have a nice light smell, not too greasy. i look for something moisturizing yet also something that lathers up well. Right now I am using Ivory. I love a body wash that leaves my skin feeling soft and refreshed and leaves a subtle scent. I usually use Softsoap or Suave. I like a moisturizing body wash with a great scent, thanks! Suave is my favorite. I like a body wash that has a nice lather.